Nearly 18 months ago, the well that supplies the home of Guillermina Andrade and Vicente Tapia with running water went dry. Ever since, the couple from East Porterville in Tulare County, California, fetches water as a regular chore. Twice a week, they fill five 208-liter (55-gallon) barrels at a depot in town, load the barrels on the back of a pickup truck, and drive home. They cannot drink this water. It is only for bathing, flushing toilets, and washing dishes. Tulare County is the center of California’s drinking water crisis. Polluted with farm fertilizer, the groundwater that so many rural residents rely on is now running out. California officials counted 1,908 dry wells in the state as of June 18. Seven out of 10 dry wells are in Tulare County, and four out of 10 are in a single town, East Porterville. County officials expect even more wells to go dry this summer. The water table is already low, and little moisture soaked into the ground during a historically dry winter. Residents, many of whom are farm workers, are frustrated and exhausted. They worry about their children developing back problems from carrying water. They want solutions. 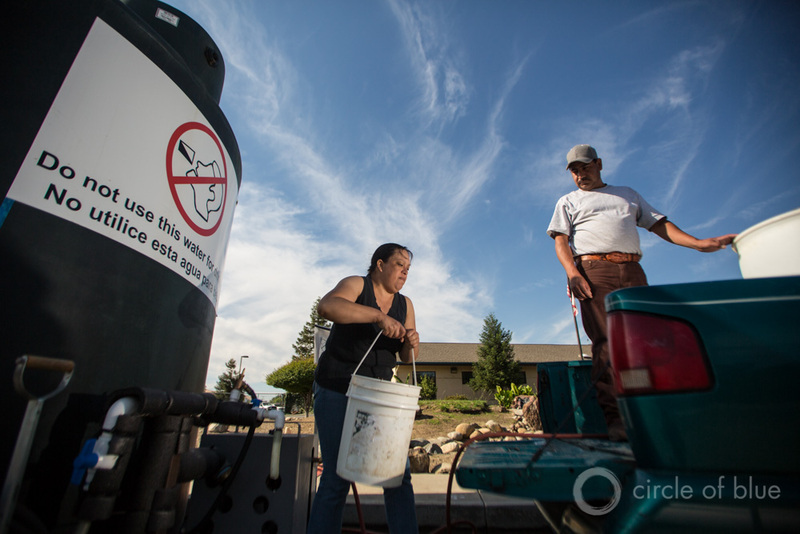 Guillermina Andrade (left) and Vicente Tapia fill five 208-liter (55-gallon) barrels twice a week from this water depot outside the East Porterville, California, fire station. The well at their nearby home ran dry 18 months ago. Click image to enlarge. Vicente Tapia transfers water that will be hauled to his home from the nearby fire station. 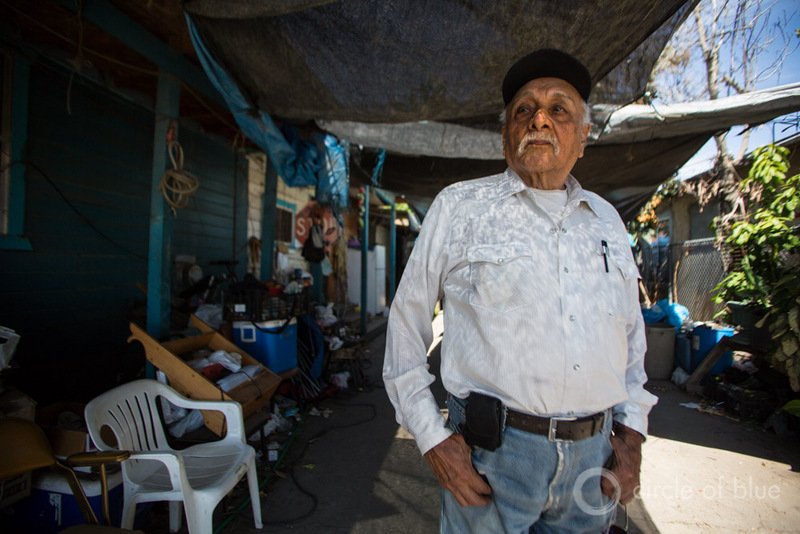 Wells in his East Porterville neighborhood ran dry nearly two years ago. Click image to enlarge. 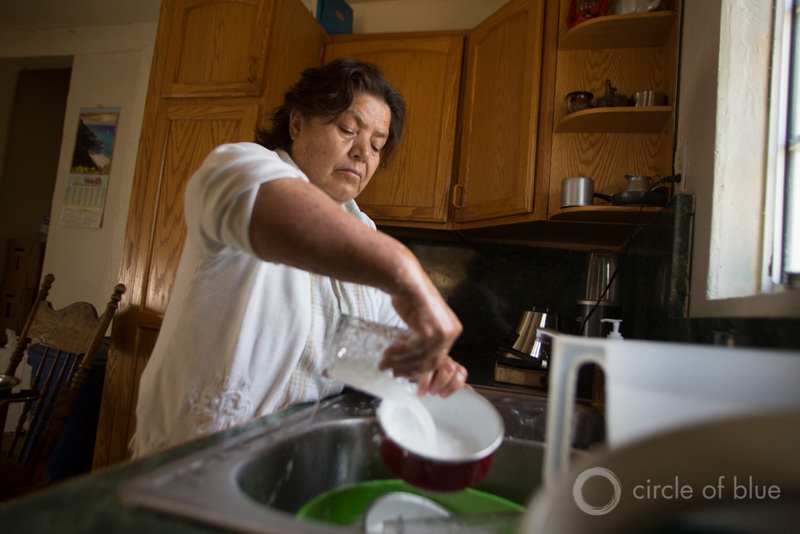 Belan Ruia makes every drop of water count as she washes dishes in her East Porterville, California, home. Like her neighbors, her well ran dry nearly two years ago. Now she and her husband, Artemio, get water from a nearby fire station. Click image to enlarge. 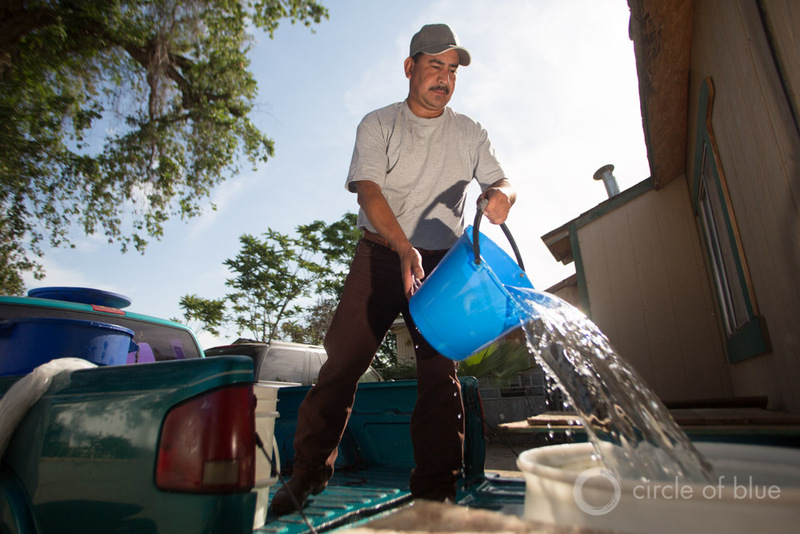 Jesus Quevedo stands outside his home in Cutler, an agricultural community in California’s Central Valley that has been hit hard by persistent drought. Cutler’s back-up drinking well is contaminated with DBCP, an agricultural fungicide. Many residents like Quevedo buy filtered water from a vending machine for $US 0.35 per 3.8 liters (1 gallon). Click image to enlarge. 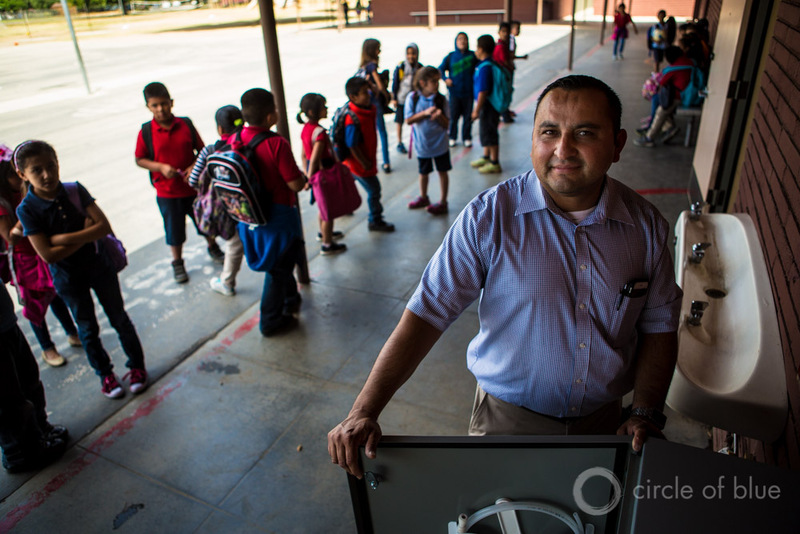 Nef Perez, director of maintenance and transportation at Sierra Vista Elementary School in Arvin, California, stands near a newly installed filtered water fountain. The school installed the system to remove water contaminants such as arsenic and is providing refillable water bottles to students. Click image to enlarge. Sunset in Porterville, California. Click image to enlarge.